Although I had hopes for Ave Maria University when I heard it would locate in Naples, Florida, (at last, someone who could talk about something other than golf!) I began having suspicions that Tom Monaghan had control issues. He wanted a town where he could control everything, and I mean everything. The staff would dress properly. In hopes of bringing clarity and unity among all employees with respect to the dress code policy, I have been asked by the University Council to communicate the following information: Attached is the revised AMU Dress Code Policy. As you will note, it is a clarification of the existing policy to provide clearer direction of what is and is not acceptable professional business attire. Male employees are required to wear business attire that effectively promotes the professional image of Ave Maria University; meaning, jackets and ties are required with a preference of suits for faculty: suits are required for staff. Of course, this is in conjunction with the stipulation noted in the policy regarding employees working in certain areas of the organization that warrants dressing differently. In addition, beginning August 30, 2010 the AMU Dress Code Policy will be revised to state that female employees will no longer be permitted to wear slacks or pant suits during work hours. They will however be permitted to wear slacks when traveling. Although this is a major change for some of you and certainly comes with a cost for adding skirts, suits, and dresses to your existing wardrobe, it is the intent of Senior Management to work with local retailers in the hopes of providing suitable business clothes such as skirts or skirt-suits at discounted prices. This information will be shared as it becomes available. Please keep in mind that we are implementing this change to improve our overall appearance as an institution of professionals. Knowing that this change will require time and planning, Management believed it important to provide several months advanced notice. It is the expectation that all employees will adhere to the policy as written and management will enforce the policy accordingly. I like the word “enforce.” My wife was approached about teaching at AMU (for free of course) but she said no one from Michigan was going to tell her how to dress. The Ave Maria Gallery and History Exhibit has opened in La Piazza, the town center of Ave Maria, a community and university at Oil Well and Camp Keais roads in eastern Collier County. The gallery displays a variety of archival items that relate to Ave Maria University and its founder, Tom Monaghan, who also was the founder of Domino’s Pizza and owner of the Detroit Tigers. – The founding of a university: Photographs spanning the building of the university from the tomato fields that preceded it to today, as well as the construction of the Oratory, from its first sketches to its completion. – Fine Art Gallery with artwork for viewing and sale. – A tribute to the late Pope John Paul II: A bust of Pope John Paul II, a chair that was custom built for his historic 1987 visit to Detroit, plus photographs of the Mass at the Pontiac Silver Dome in Detroit and more. – Detroit Tiger baseball archives: The 1984 World Series trophy, one of Al Kaline’s Gold Glove Awards, a Joe DiMaggio designed baseball glove chair and assorted signed memorabilia. – A brief history of Domino’s Pizza: The sign from the first store, plus archival photos and historical information. – Model of Frank Lloyd Wright House: An architect’s rendition of the Robie House in Chicago. The exhibit, which will continue to grow and evolve, is at 5072 Annunciation Circle, No. 103 next to Tropical Smoothie. Chapel of Our Lady of the Most Holy Trinity, Thomas Aquinas College, Ojai, California. 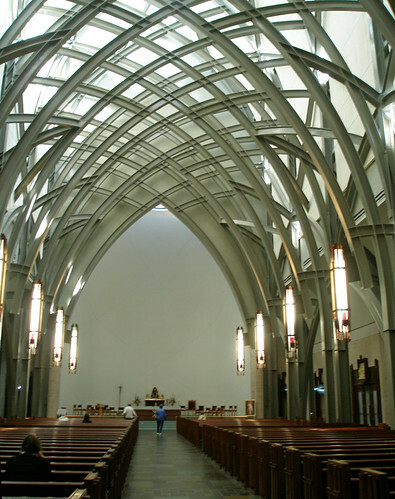 Architect: Professor Duncan Stroik, School of Architecture, University of Notre Dame. Cost $22 million. 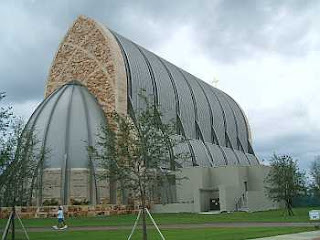 Oratory, Ave Maria College, Ave Maria, Collier County, Florida. Architect: Thomas Monaghan, founder of Domino’s Pizza. Cost $24 million.